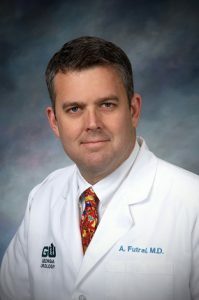 Dr. Allen Futral, III is a partner with Georgia Urology, practicing in Conyers and Covington, GA.
Dr. Futral completed his undergraduate studies at Davidson College in Davidson, NC. He received his medical degree from the University Of Virginia School Of Medicine and completed his urologic residency at Emory University, where he was awarded the Grady Service Award and the Bill Cooner Award for Compassion and clinical ability. He is board-certified by the American Board of Urology. Dr. Futral is on the staff of Rockdale Medical Center, Newton Medical Center, Northside Hospital, and DeKalb Medical Center.